One of the hallmarks of the ISTScholar PhD program is the shared graduate school experience. An initial stage of rotations and cross-disciplinary coursework encourages broad exposure to important scientific approaches and problems, allowing students to lay a solid foundation for intensive research in the second phase of the PhD program. 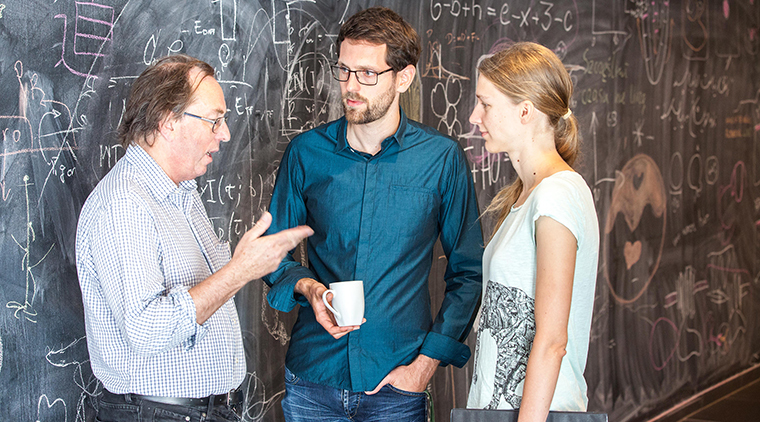 We are looking for highly qualified candidates to apply for the ISTScholar PhD program. See the page “How to Apply” for more details. The goal of the ISTScholar PhD program is to produce intellectually broad, curious, open-minded scientists who are able to approach problems from different angles and can collaborate with diverse types of scientists. To this end, our students complete an innovative interdisciplinary training program consisting of both research and taught elements, and receive close mentoring by world-class faculty from different disciplines. All students whose broad research interests align with those of our faculty are eligible to join the ISTScholar PhD program. Selection of the thesis supervisor occurs at the end of the first year. In the first year, students complete coursework and rotations in three different research groups. After selecting a thesis supervisor and passing the qualifying examination, students work on their thesis research, attend international conferences and colloquia, and receive training in teaching and other transferable skills. Research groups are deliberately kept small to ensure close supervision, and all students are mentored by several faculty members who make up their thesis committee. The program is designed for students to complete their studies in 4-5 years. All students making reasonable progress are fully funded until the time of their thesis defense. 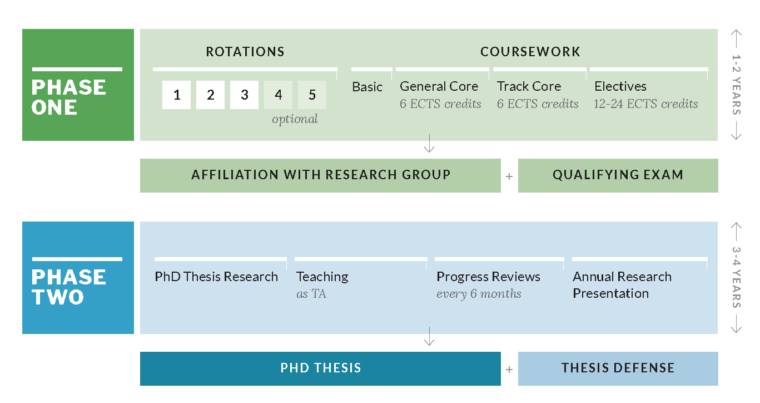 Overview of of the ISTScholar PhD program: Phase 1 consists of rotations and courses, and culminates in a qualifying exam. Phase 2 comprises PhD thesis research, teaching, and regular progress reviews. The interdisciplinary core courses are designed to encourage the exchange of knowledge between students from highly diverse backgrounds and promote the conditions which allow for interdisciplinary research. A broad view of topics are presented to students to encourage them to think beyond the boundaries of their primary research focus. In addition, the courses fulfill a community-building function in terms of fostering exchange between students from different disciplinary backgrounds. In addition to the interdisciplinary core courses, students also take specialized and advanced courses as part of the PhD program. For further details of our course offerings, see our list of courses. Listen to what Carl-Philipp Heisenberg and Michael Sixt have to say about interdisciplinarity at IST Austria. Students perform at least three rotations with three different research groups. A rotation is a period of roughly two months in which students perform research in a laboratory on a research project. 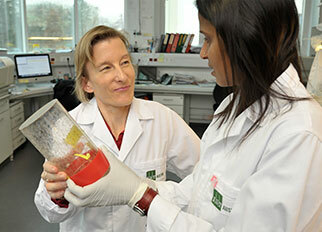 It is on the basis of this experience that students can choose to affiliate with a research group. It is also an excellent opportunity for students to learn to think across disciplines and build up cross-disciplinary skill sets. In order to further your work the most successfully, you have to first be a well-trained scientist and that requires a broader perspective than only laser-focused research. In the qualifying exam, students’ knowledge within their proposed research area, their ability to identify important research problems, and their capability to come up with ways to tackle these problems, are assessed by the thesis committee. The qualifying exam takes the form of a presentation and oral exam. Students must pass the qualifying exam to continue on the PhD program and perform thesis research. Upon passing the qualifying exam, students conduct thesis research within a research group. There are biannual reviews which evaluate the students’ progress, and ensure that they stay on track towards completion of the PhD. Students are also encouraged to present their results at scientific conferences, and annually, present their research within the Institute. IST Austria hosts a range of seminars, colloquia, and conferences which aim to encourage interaction between scientists and which allow students to become familiar with a diverse range of scientific research areas. See events, for a selection of such program activities. All our PhD students are fully funded, at internationally competitive salary levels, and receive full social security coverage. There is also financial support for students for attending scientific conferences and workshops. For more information, see the page on “Funding“. The length of the PhD program is typically 4 to 5 years, depending on whether a student has a bachelor’s or a master’s degree when starting their PhD. If you have any questions about the ISTScholar PhD Program, go to our Frequently Asked Questions section to see if you find any answers there. In case you have any other questions, please contact us at gradschool@ist.ac.at. This project has received funding from the European Union’s Horizon 2020 research and innovation programme under the Marie Skłodowska-Curie grant agreement No 665385.